A Tribute to Richie Havens! I first heard Richie Havens [Richie who???] on a Woodstock Tape that I bought. ... and no, it wasn't the one with "Freedom" on it. It had this marvellous song called "I can't make it anymore"  (a Gordon Lightfoot song). God knows how many times I  must have listened to that song after that. it was out of this world! unique...absolutely! One thing that struck me most was the way he played his guitar....very strange indeed. impossible unless you've got a 9 inch thumb!!!). I'm sure Richie's a man with HUGE hands :O). Since then, I've finally got a hold on "RESUME" - a collection of his hits. be the perfect place to start). Richie's covered some beatles stuff here. Ex: Take the song 'Rocky Racoon'. The original is a great song , lots of melody et al. groovy "fill ins" (most notably on Minstrel from Gault---another terrific no). Enough said. Now get the album and give it a listen. Remember its Folk -with a difference. Here's a shot of Richie in action which I stole off an other site! Info on Richie's guitar, tunings , and chords to his songs. Go on to this page. NOTE: All "external" links will open in the same new window. 2) September 24, 1971 issue of LIFE magazine featuring Havens. 3) Hobokenfest article on Richie. 4) Richie's new book "They can't hide us anymore" - read a chat transcript at Barnes and Nobles.com! 5) About.com's section on Richie and some nice pics too! 6) New! An article on Richie's book at CNN - includes mp3s! Be sure to check out his wonderful performance of "Just like a Woman". 7) An article/interview of Richie at Creative-Outpost. Radio Woodstock - Check out real audio interviews of Richie! Karen's Web Page - Karen's put up great pics of Richie in action! Brian Mathieson's Richie Havens Pages - Brian's put up a great site. This was the first one and its pretty comprehensive too!! 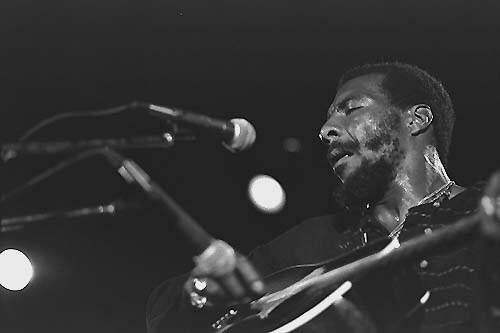 New!The Unofficial Richie Havens Website - Timi's put up a great site - Lots of pictures and album covers + more!! The Official Richie Havens Homepage - Yup, it exists !! !